On this side you will find our broad range of products on the field of moisture analysers consisting of moisture indicators for different materials or moisture. Our moisture analysers are available for temperature ranges from 30 to 250 °C and for weighing ranges up to 210 g. Some of our moisture analysers come with USB-Interface which makes it possible to transfer measuring results to a computer, where the data analysis can take place. The moisture analysers are mostly applied the industrial sector where they are used for the determination of moisture in different materials as pastes or wood. Therefore, they can help in quality assurance as well as in production. If you can't find the moisture analysers you are looking for, feel free to call our offices ( UK customers +44(0) 23 809 870 30 / US customers (561) 320-9162. 0). Our technical staff will advise you regarding our products. Our engineers and technicians will be happy to help you with the moisture analysers, and of course, with the other products in the field of regulation and control, and measuring instruments. The dielectric method makes measurements of titled surfaces with floor heating system possible, when drilling would be too dangerous. The method is based on electrical conductivity and the dielectric constant. Actually, the capacity of a capacitor is measured. If the dielectric constant is higher than normal, the material has a high moisture ratio. Just like the dielectric measuring device, the resistance moisture tester is based on electrical conductivity. In the beginning, this method was only applied in the timber industry and forestry, but today, the measurement of mineral material is possible. That makes the use in building moisture measurement possible. With the help of 2 electrodes, the electrical resistance is determined. The resistance changes according to the moisture ratio and is illustrated on the display. Different probes are necessary for certain fields of application (surface, depths…). For this method, the change in the weight during a drying process is measured. The difference between the moist and dry weights is used to determine the loss of moisture. It is a non-destructive way to determine the moisture value which requires a sample from the moist material. Besides the balances themselves, there are also some additional accessories available for the moisture analysers. By using our data cables, the measured data can be transferred directly to a PC via RS-232 or USB interface, where our software kits offer further features to analyse and store the values. We also provide printers which can be directly connected to the moisture analysers via RS-232 interface, so the results can be printed as soon as they have been obtained. If you want to measure materials which tend to spatter or encrust, we recommend the use of fiberglass round filters. 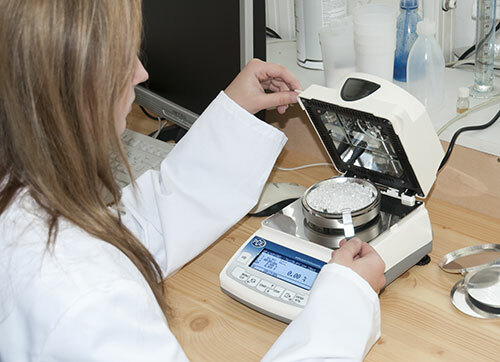 With our test weights the moisture analysers can be recalibrated on the side at any time. In order to meet ISO 9000 standard, moisture analysers can be ordered with an official ISO calibration certificate (optional: when the scale is ordered or as an annual recalibration). An ISO calibration can be done by every accredited laboratory tester.